Bahrain: Framed By Funerals, Another Day Of Protests Turns Violent : The Two-Way There wasn't any more violence earlier today after funerals for protesters killed by authorities on Thursday. But it's feared there may be clashes later. The day in Bahrain started with funerals of those killed in yesterday's protests. Things quickly turned violent as some of the mourners became protesters and headed toward Pearl Square in Manama. Then, as NPR's Peter Kenyon reported, government forces opened fire. The New York Times' Nicholas Kristof told NPR there was no warning, no tear gas, the police and army "just opened fire on them." At one point, the crowds were fired at from a helicopter. Another New York Times reporter and videographer took fire from the helicopter. Keep scrolling to read an archive of how the day evolved. We're going to pause our blog right here, but if anything major breaks, we'll jump back in. Update at 6:29 p.m. ET: The Telegraph has received more leaked diplomatic cables from WikiLeaks. This time, the British paper says it received cables that describe a meeting between Bahrain's king, Hamad bin Isa al-Khalifa, and General David Petraeus. King Hamad, the paper reports, told Petraeus he believed that opposition groups in Bahrain were receiving training from Hezbollah in Lebanon. In that talk, as well as in other cables, Bahrain expresses concern that Iran is looking to annex the island nation. In the cables, U.S. officials cast doubt on all the claims, saying they could never find credible evidence of Hezbollah's interference. "In private," reports The Telegraph one of the cables read, "Bahrain's leaders do not seem very concerned about the prospect of annexation to Iran." Update at 4:05 p.m. ET: We're continuing to collect reports about another harsh crackdown on protesters today in Bahrain (you can hear shots being fired in the sound clips below from NPR's Peter Kenyon). There are reports of many injuries and some deaths. "I was standing there, I was right in front of the crowd when the army opened fire. There was no warning. There was no indication they were going to shoot. Nobody said 'stop.' They just opened fire," New York Times reporter Michael Slackman just told producer Claudine Ebeid of NPR's Newscast desk. As to whether he and his videographer were deliberately fired at, Slackman said that after they had gotten away from the scene of the shooting they stopped to record a video report. "The minute we finished the video, this helicopter came over and started shooting at us. No question about it. They targeted us. I suppose from the helicopter they had been able to see were doing a stand-up." The helicopter, he said, followed as they ran and kept shooting. A local man stopped his car, picked them up and drove them away. "I don't know if they were actually trying to hit me," Slackman said. "I suspect if they really wanted to they could of. Maybe they were just trying to send a message. And they did." Slackman also said the crackdown may not deter the protesters. 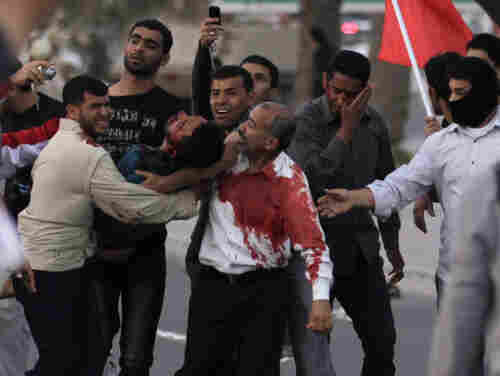 "These young kids," he said of the protesters, "walked into the jaws of the Bahraini defense force" knowing they might be shot at. "They knew what they were doing. That's why, when you asked 'does the use of lethal force mean that they will stay home?' I don't know. I don't think so." Update at 3:05 p.m. ET: We noted earlier that The New York Times reported about a reporter and videographer being shot at by someone patrolling above in a helicopter. The Times has now posted a video showing that it was its own Michael Slackman who was shot at. He was not injured. Update at 2:40 p.m. ET: The sound of gun fire, recorded as NPR's Peter Kenyon was speaking to NPR's Newcast division, was among the first things we included in this post (scroll down if you want to listen). Just a short time ago, The New York Times' Nicholas Kristof gave All Things Considered host Michele Norris his description of what happened when protesters turned toward Manama's Pearl Square and were fired on. "There was no warning. Not even tear gas fired," he said, "and all of a sudden, police and army opened fire on them." Here's some audio from his conversation with Michele. More will be on ATC later today. Click here to find an NPR station that broadcasts or streams the show. Update at 2:15 p.m. ET: We're continuing to collect reports about another harsh crackdown on protesters today in Bahrain (you can hear shots being fired in the sound clips below from NPR's Peter Kenyon). There are reports of many injuries and some deaths. "Bahrain's King Hamad has just ordered the Crown Prince to get things sorted. Dialogue with all parties. Tough sell at this point." "I am deeply concerned by reports of violence in Bahrain, Libya and Yemen. The United States condemns the use of violence by governments against peaceful protesters in those countries and wherever else it may occur. We express our condolences to the family and friends of those who have been killed during the demonstrations. "Wherever they are, people have certain universal rights including the right to peaceful assembly. The United States urges the governments of Bahrain, Libya and Yemen to show restraint in responding to peaceful protests, and to respect the rights of their people." We're continuing to collect reports about another harsh crackdown on protesters today in Bahrain (you can hear shots being fired in the sound clips below from NPR's Peter Kenyon). There are reports of many injuries and some deaths. "Bahrain's crown prince, known as a reformer among royals in the Gulf Arab kingdom, called on Friday for calm, saying it was 'time for dialogue, not fighting,' " Reuters reports. Crown Prince Sheikh Salman bin Hamad al-Khalifa appeared on Bahrain TV a short time ago. Blogger Sultan Al Qassemi, who was monitoring the prince's statement, reports he also said: "We need to call for self-restraint from all sides, the armed forces, security men and citizens." The Associated Press adds that "officials at the main Salmaniya hospital said at least 50 people were injured, some with gunshot wounds. Some doctors and medics on emergency medical teams were in tears as they tended to the wounded. X-rays showed bullets still lodged inside victims." -- "Just seen one man in hosp hit with live round in the head. In terrible shape. Not expected to live." -- "Man shot in the head just died." -- "Easily 10k people - all seething - inside hospital grounds. Anti regime chants non-stop." Update at 10:42 a.m. ET: The New York Times says that "forces in a helicopter fired on a reporter and videographer who were shooting a video on the latest violence." Update at 10:30 a.m. ET: We're continuing to collect reports about the gunfire today in Bahrain (which you can hear in the sound clips below from NPR's Peter Kenyon), where it appears the government has again cracked down on protesters. There are reports of many injuries and some deaths. -- "Man in blood drenched shirt just walked in. Drs outraged, helping me get stories and video." -- "Seems to be mostly rubber bullets. But terrible, gaping wounds, maybe meaning close range." Update at 10:20 a.m. ET: The Associated Press reports that "soldiers fired tear gas and shot heavy weapons into the air." CNN, though, says at least one person — a doctor — was killed. NPR's Peter Kenyon was on the phone with NPR's Newcast just a short time ago. He was describing how a "large crowd" was walking toward the circle. "As they got close, as the front edge of this very long line of marchers got close, the sound of shots erupted — scattering everybody. I think I saw one person with a gunshot wound. I can't confirm that yet, they were carrying him off in a pickup truck. It looked like blood on the leg." Then, as Peter was continuing to speak, the sound of ambulance sirens could be heard — followed by the sound of shots. "Ambulances had come and they were approaching, trying to get to the square ... and more shots were fired," Peter said. "The ambulances, most of them, quickly turned around and sped away." Update at 9:33 a.m. ET: We just heard shots being fired in the background as NPR's Peter Kenyon was reporting from near Pearl Square in Manama. It's not known yet whether it was live ammunition, rubber bullets and whether the shots were aimed at the protesters. We'll add the audio as soon as we can. One day after several people were killed and several hundred were wounded in Bahrain during a crackdown on protesters, there were emotional funerals today. As NPR's Peter Kenyon reported yesterday, the mood among the mostly Shiite Muslim protesters in that Gulf State ruled by Sunnis seems to have turned from a demand for reforms to a demand for new leaders. Today, he says, there was no violence during the early funerals. But "whether there will be clashes later, we don't know. ... The situation is peaceful at the moment, but no one knows where it's headed." Reminder: NPR's Andy Carvin (@acarvin) is following what's being posted on Twitter about events in Egypt, Bahrain, Libya and other countries being rocked by protests. There's also lots of information being collected by StoryfulPro (@storyfulpro).